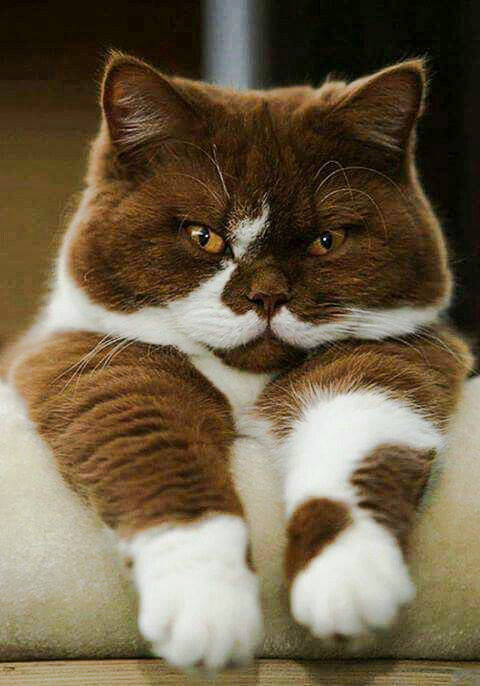 This is a nice picture of a relaxed looking chocolate-and-white domestic cat; the sort of domestic cat that you would like to own, I would suggest. His (I’m going to guess that he is male) appearance indicates to me that he might be a purebred cat, possibly a British Shorthair. He is a confident looking cat which is always desirable. He doesn’t mind being photographed by the look of it. Not all cats like to have a camera pointed at them. The chocolate colour in a domestic cat is, I think, very attractive. It is particularly attractive when mixed with white. He is a bicolor cat. This entry was posted in bicolor and tagged bicolor cats, cat coats, chocolate coat by Michael Broad. Bookmark the permalink. Yes, absolutely correct. I tend to use conventional terminology for the sake of practicalities but prefer ‘caretaker’ or ‘guardian’ rather than ‘owner’ but in a title to an article it gets too complicated and most visitors use ‘owner’. I know Micheal I was smiling when I posted it.